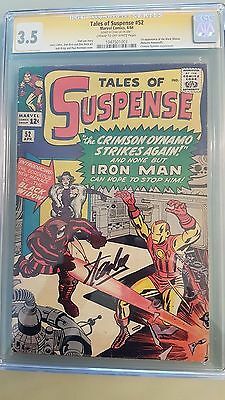 Tales of Suspense #52 Signature Series Stan Lee Yellow Label. 3.5 CGC graded, first appearance of Black Widow! I ship worldwide and combine shipping. Sorry, but due to some frustrating non paying bidders, I require payment within 24 hours of win. I will ship within 3 business days of payment (normally in 2 days). Please pay promptly or I will be forced to relist the item. Unfortunately, I won't take returns on CGC graded books, please view pictures. Check out my other auctions, other key books for sale.